Our story opens with a cat stuck in a tree, an ordinary-enough occurrence. Fletcher the cat, having run up the tree in a moment of thoughtless abandon, cannot get back down. Then strange things begin to happen: Fletcher finds in his tree a steamer trunk full of hats, and among the hats a papier-mâché egg that opens to reveal Zenobia, a worldly talking doll who was locked in the egg by an unfeeling child named Mabel. To cheer each other up, Fletcher and Zenobia decide to throw a party, complete with cake, peach ice cream, and punch from a silver punch bowl. The hats come in handy, and a moth, drawn to the festivities, soon becomes the vehicle of an unexpected escape plan. 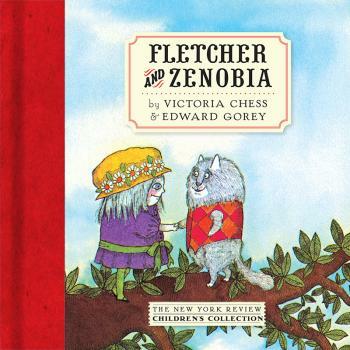 A story of metamorphosis and friendship, like The Owl and the Pussycat crossed with Alice in Wonderland, Fletcher and Zenobia is a wildly imaginative tale of wish fulfillment and freedom. At once silly and zany, it is not without a certain delicacy of feeling that older children, and adults, will also appreciate. Victoria Chess was born in Chicago in 1939 and attended the Kokoschka School of Art in Salzburg, Austria, and the Boston Museum School. The illustrator of more than a hundred books for children, Chess was awarded the Brooklyn Art Books for Children citation from the Brooklyn Museum and the Brooklyn Public Library in 1973 for Fletcher and Zenobia, and the 1975 American Institute of Graphic Arts Book Show Award for her illustrations for Bugs, a book of poems by Mary Ann Hoberman. She lives in Cambridge, Massachusetts, and the south of France. Edward Gorey (1925–2000) was born in Chicago. He studied briefly at the Art Institute of Chicago, spent three years in the army, and attended Harvard College, where he majored in French literature. In 1953 Gorey published The Unstrung Harp, the first of his many books, which include The Curious Sofa, The Haunted Tea-Cosy, and The Epiplectic Bicycle. In addition to illustrating his own stories, Gorey provided drawings to many books for both children and adults. Of these, New York Review Books has published The Haunted Looking Glass, a collection of Gorey’s favorite ghost stories; The War of the Worlds by H. G. Wells; Men and Gods by Rex Warner; and Three Ladies Beside the Sea and He Was There from the Day We Moved In by Rhoda Levine.